Every Saturday morning I listen to The Gospel Greats with Paul Heil on Life 100.3 (89.3 here in Peterborough) when possible. This morning they announced the most recent inductees to the Southern Gospel Music Hall of Fame. One of those was Gloria Gaither. She mentioned that Southern Gospel singers have often been accused of only singing about two (2) things...the cross and heaven. Not a bad accusation if you ask me! 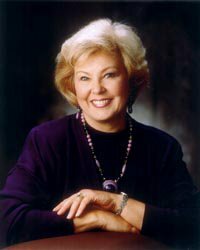 One of Bill and Gloria Gaither's lesser known songs was "Between the Cross and Heaven There's a Whole Lot of Living Going On". If you're a follower of Jesus that's where you stand today...between the cross and heaven. Not a bad place to be! We look back on the cross (The Old Rugged Cross Made the Difference For Me) and look forward to Christ's return (The King is Coming) and our heavenly home. Regardless of what circumstances you find yourself in today, revel in the fact that you stand between those two great markers in human history...the cross and heaven. Because He Lives we can face tomorrow! The Gentle Shepherd will lead you through the valley and bring you safely home.